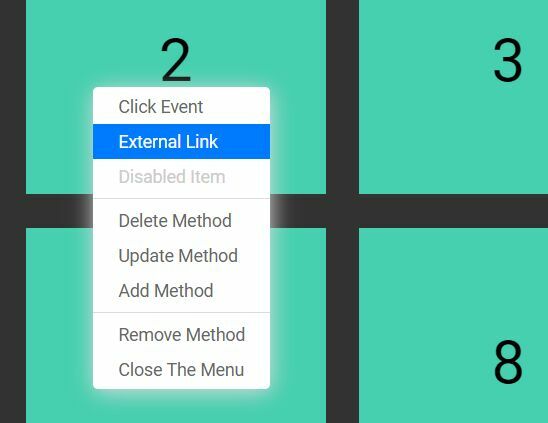 Allows to append the context menu to any element. Custom trigger events, not only right click. Auto adjusts position and size to fit in viewport. 1. 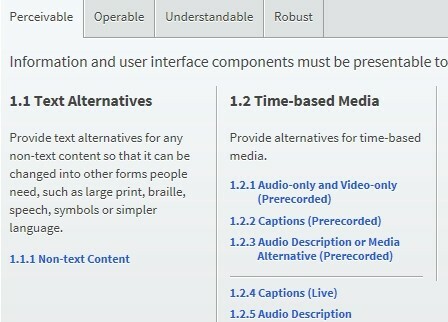 Include the jQuery contextMenu's CSS file in the head section of the html document. 2. 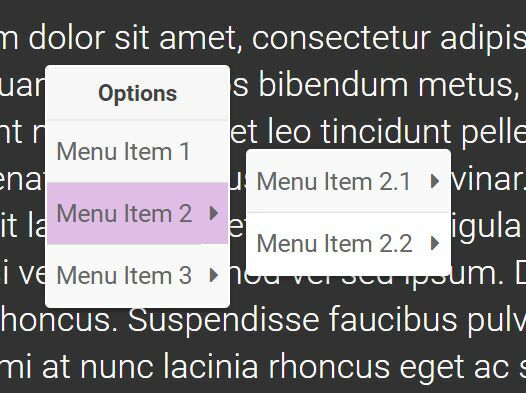 Create an element where you want to append the context menu to. 4. 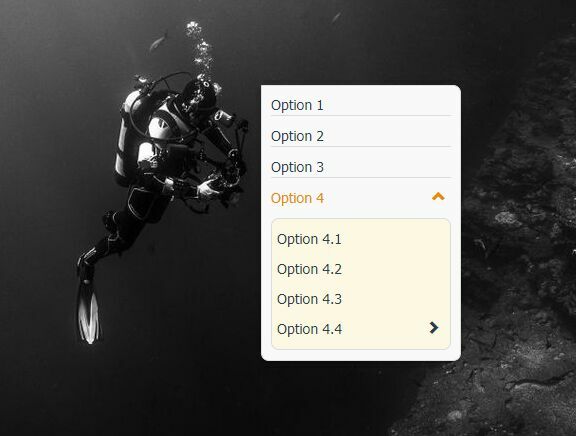 Create your custom menu items and bind the context menu to the element 'demo'. 5. Here's a full list of configuration options you can use to customize the context menu. contextmenu: Trigger context menu to be shown for a trigger object. contextmenu:blur: Available on each context menu item. keydown: Available on each context menu item. Add getting started to the documentation. Fix typo in documentation which breaks the callback demo. Add options argument to events.activates. Add `box-sizing: content-box;` to scss to fix bootstrap. Ability to define touchstart as trigger. Extra event activated that triggers after the menu is activated. Flag denoting if a second trigger should close the menu. Added update call to update visibility, disabled, icon and form value stats for items. Fix for out of bounds problem on window edges. Broke build script after 2.5.0 which ment no updates to dist folder. Fixed Dev dependency ended up in normal dependencies. Fixed: trigger is sometimes called on undefined objects because of typecheck on null. Changed the inline style causes a Content Security Policy violation if style-src 'unsafe-inline' is not defined in the policy. Added SauceLabs tests for common browsers. 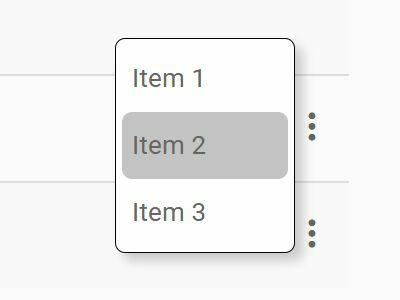 Small fix for hover color of input item. 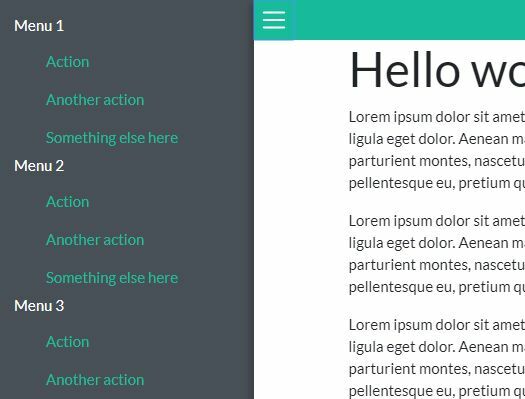 This awesome jQuery plugin is developed by swisnl. For more Advanced Usages, please check the demo page or visit the official website.